"Legend" is the much-lauded dystopian thriller debut from US author, Marie Lu. The must-read dystopian thriller fiction for all teen fans of "The Hunger Games" by Suzanne Collins and Divergent by Veronica Roth. A brilliant re-imagining of "Les Miserables", the series is set to be a global film sensation as CBS films have acquired rights to the trilogy. The "Twilight Saga" producers, Marty Bowen and Wyck Godfrey, will produce. LEGEND is the first book in a trilogy (all three will be available as match-numbered limited editions). LEGEND is being made into a major motion picture along the lines of THE HUNGER GAMES, which will increase the collectibility of our limited edition. Legend, the first book in the trilogy, is set in a dark, futuristic Los Angeles. It tells the story of two young people from opposite sides of the tracks: Day, a fifteen-year-old boy from the slums who has become America's most wanted criminal, and June, a fifteen-year-old from a wealthy family who is America's most gifted soldier-in-training. The two's paths seem like they should never cross—but when June's older brother is murdered in the line of duty and Day is the main suspect, June sets out to hunt Day down and bring him to justice. But seeking out her brother's killer brings unexpected revelations about her world, society, and family. In this new America, what is truth and what is a lie? This limited edition has loads of bonus material not found in the mass market version. Besides being a wonderful novelist Marie is an accomplished artist. Marie Lu created several character sketches of June and Day, which are included. These sketches are exclusive to this limited edition. This limited edition also contains two outtakes, character profiles of June and Day, and an alternate ending. One of the outtakes and the alternate ending will appear in all editions of the book. The longest deleted section will appear only in the lettered edition. Marie will also provide an introduction to the novel (again, exclusive to the limited edition). LEGEND is signed by Marie Lu and The New York Times Best Seller author Ridley Pearson, who wrote an Afterword for the book. Synopsis : Los Angeles, California Republic of America He is Day. The boy who walks in the light. She is June. The girl who seeks her brother's killer. On the run and undercover, they meet by chance. Irresistably drawn together, neither knows the other's past. But Day murdered June's brother. And she has sworn to avenge his death. Dystopian fiction at its very best in this thrilling instalment in the Legend trilogy. Praise for "Legend": "If you loved "The Hunger Games", you'll love this". (Sarah Rees-Brennan, author of "The Demon's Lexicon"). "A fine example of commercial fiction with razor-sharp plotting, depth of character and emotional arc, 'Legend' doesn't merely survive the hype, it deserves it". ("New York Times"). 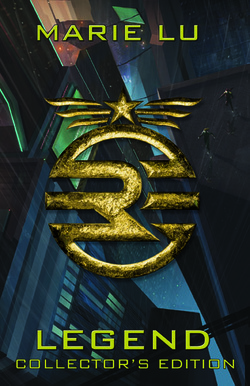 "Marie Lu's dystopian novel is a "Legend" in the making". ("USA Today"). ""Legend" is impossible to put down and even harder to forget". (Kami Garcia, author of "New York Times" bestselling author of film sensation, "Beautiful Creatures"). Marie Lu is a US author who works as an art director for a video game company. "Legend" and its brilliant sequel, "Prodigy" were built round the world that Marie Lu created for a popular Facebook game also called "Legend". She was born near Shanghai but currently lives in California.